Recently, I found some tools and tutorials that allow me to mod one of my all-time favorites, MechCommander Gold. MechCommander's default resolution is 640x480. It is possible to change the resolution to 800x600, 1024x768 and 1280x1024 through a hidden setting in the prefs.cfg, but those resolutions aren't really 'modern' anymore. In the original game, some weapons were incredibly useless (IS Light Autocannon, LBX ACs), while others were totally OP (Large X Pulse Laser, Clan ER PPC). As a result, there were many weapons that didn't see any use, and others were used almost exclusively. I do not intend to make an IS Light AC match a Clan ER PPC of course, I'll just change the stats so that the difference is less extreme, and every weapons at least has some value. Examples: The Light AC mentioned above has little firepower, weighs a lot and has limited ammo. It is so bad that even at the beginning of the original Port Arthur campaign, no one right in their mind would use it. Ever. It's still worse than many other weapons, but thanks to the reduced weight some people might use it now. The Large X Pulse Laser on the other hand had the best damage-per-second-per-ton rate of the entire game. It is even superior to the Clan Pulse Lasers in that regard, so once you gain access to this, there's no point in using any other Pulse Lasers. Also, this efficiency is completely non-canon, in real BattleTech the Large X-Pulse is just a Large Pulse with increased range (well, and increased heat output). Even with this kind of nerfing, the LXPL is still better than regular IS PLs, and performs close to Clan PLs. These are just two examples, there are lost of other changes, sometimes significant (for example, all LBX ACs received a ~70% efficiency boost, since my tests have shown them to be absolutely laughable in terms of dmg/sec/ton). Well, I'm not sure if 'bug' is the right term for the issues I'm tackling, but it goes in the right direction. Example 1: MC Gold introduced the ability for the player to order his Mechs to target specific body parts of enemy Mechs. The problem: Due to far-too-cautious settings, under normal circumstances the chance for successful headshots was ZERO. Yes, null. And the chances to hit other body parts? Better, but far too low to be even remotely useful. Well, I'm fixing that. When a Mech is ordered to shoot at an enemy Mech's head, most shots will still miss, but there will be enough hits that with some luck (and pilot(s) with good gunnery skills) the enemy will be killed almost as fast as with random shooting, but WITHOUT destroying the valuable Mech chassis. Example 2: For some unknown reason, in default configurations the developers placed the Long-Range Missiles of the Catapult mech in its torso, and the two medium pulse lasers in the "arms". The thing is, the "arms" of a Catapult ARE missile launchers, so it looks kinda strange and contradictory when you see laser blasts coming out of missile launchers, and missiles out of the torso. Such contradictions will be fixed for all default configs. Even when ignoring the weapons, there are several balancing issues, as well as some inconsistencies. Example 1: The Atlas-A has 18 tons of armor, the Atlas-W has 12. So the Atlas-A has 50% more armor, but the Atlas-W can carry only ~10% more weapons (66 vs. 60 tons, or something like that). As a result, an Atlas-A will ALWAYS be vastly superior to an Atlas-W (assuming both are equipped with the best possible weapon load, of course), because on average it can take 50% more damage, while the W can only deal ~10% more damage. For that reason, in my opinion the whole concept of A(rmor),W(eapon) and J(umpjet) configurations is flawed, because for nearly every Mech you're better of with either the A or J config, W configs are almost always useless. This will be remedied. I haven't made up my mind on how exactly I'll tackle this issue because I don't want to stray too much from canon in terms of tonnage relations, but I definitely will. 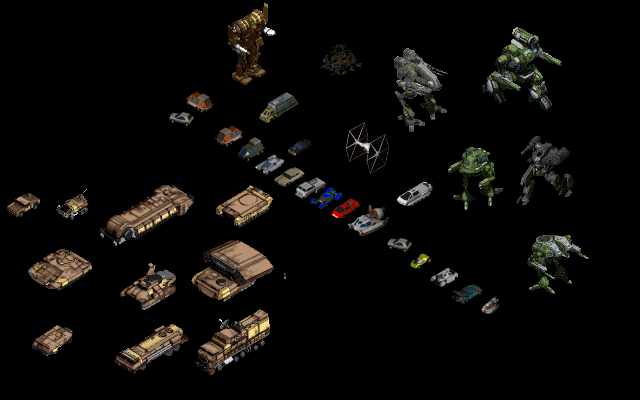 Example 2: The weapon load of several vehicles is non-canon, and in some cases so weak that I wonder why the developers even bothered implementing that unit. For example, the SRM carrier is supposed to be a 60 ton vehicle filled to the brim with SRMs. Weak armor, but great firepower. What did the developers do? They gave it a whopping six SRMs. 6 SRMs equal a single IS medium Autocannon in terms of firepower. And the 'SR' in SRM stands for short-range. And the vehicle has weak armor. And vehicle gunners usually have inferior aiming skills, so most missiles actually miss. This thing is so weak you can almost completely ingore it in battle. Well, not anymore. In my mod, it will have slightly better armor (still weak, just not as weak as before) and a total of 16(!) SRMs. Don't worry, it won't be overpowered; it will just be a bit dangerous now, unlike before. Another vehicle that will see changes is the Shrek PPC carrier. The developers gave it 2 ER PPCs (one of them a Clan version), but canon-wise it should have 3 normal PPCs, and that's what it will have from now on. While this will decrease its max. attack range, its total firepower will increase, and since I also slightly increased its armor a little bit, Shreks are now truly a force to be reckoned with, even more so than before. And just for fun, this is something I found in one of the games' files. Which one of these does not belong to the BattleTech universe? This is awesome, at least for a graphics revamp. But balance changes are also great! Only balance changes, sorry. The sprite format MC uses has not been decoded yet, unfortunately. Besides, IMO MechCommander has very good graphics already. The only problem is its low resolution, in 1280x960 & "zoomed in" it would look awesome. The pic above is a genuine, unmodified pic found in one of MCs storage files (containing the MC unit palette, btw). Wait, what? Uller never looked that good! Any progress on this mod? I'd be so stoked if you had anything you could share. Seconded!!! I registered just to tell you how excited I am to stumble on this. I play through MechCommander a couple times a year and all the things you mentioned desperately needed fixing. hi, it's great to see that i'm not the only one to be completely fond of this game. among the things that need fixing, i'd like to add the "right arm bug". that's maybe not actually a bug, but that's quite annoying to see the game systematically attribute almost every weapon in the left arm of your mechs. well of course i understand that it would be a lot of work to define for each chassis what kind of weapon should go where, but if at least it could be randomized that would be great. unless you manage to have the game avoid doubles in each body part. i hope this forum is not dead ! Your tired of playing just 42 campaign missions total? Your tired of playing just three available solo-missions? You wanted to see a version combining all what was ever done for MCG in a new game evolved? I won´t go so far to call my Full Version a "perfect" one... - but i definetely know that it is the one being closest to it compared to all other versions i could find. My version attempts to unite and offer a colloquial of all MCG Stuff ever related. I already created the biggest single-player campaigns for MechCommander of all time. In MechCommander Gold - Darkest Hours v3.0 you can already play more than 200 missions all game features compared - and it works for Multi-Player games over gameranger. I also have created a standalone of the last Mod who came out by a russian guy. Made it playable and at the moment working on introducing more missions and scenarios to play in the biggest game content offering MechCommander Version ever. Have fun, that´s an order!